Our neighborhood fireworks show was on the 3rd of July this year. It was in our backyard. Literally. They set off a professional fireworks display about half a mile from my backyard. Since they had a done such a show just a couple of months ago, I knew that we would have a clear unobstructed view. So, I did what came naturally and called a few friends to come eat and watch fireworks with us. We had a wonderful time. As people were cheerfully playing and eating and coming in and out through the back door for every possible convenience, I remembered past Independence Days that were very dependent. I remembered years of pregnant July 4ths, parking two miles from the site, lugging a toddler on top of my belly in 90+ degree heat, hauling the picnic, settling in, and then--someone always needed the potty. I called a moratorium on that a few years ago and tried to persuade my children that we could have just as much fun at home. 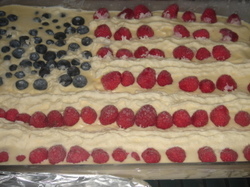 To my credit, we made a flag cake every year. They were not especially beautiful cakes. Truth is, midsummer finds my energy lagging, particularly while nursing and pregnant, and my husband was never home for the Fourth of July. It's not my finest holiday. I've always felt a little guilty about that. I'd look at post-holiday blog posts and think about how I really needed to get my act together and do better because childhood only happens once, you know. And my kids weren't having much fun on the 4th of July. Mike was home this year. We had a very nice party. It was lots of fun for everyone. And the cake? Absolutely beautiful! You know what? Sometimes, know matter how hard you try, the best you can do is just barely good enough. And sometimes, it's not about you. It's about the circumstances of your life. This year. I'm not pregnant. This year, my husband was home. This year, all the circumstances lined up to make the holiday festive and beautiful. And believe me when I tell you that we all had a hand in making the cake. Mike and Paddy baked it the night before using Ina Garten's recipe. I frosted it in the morning and then Mike drew lines on the frosting. Every year, Nicholas is very bothered that the flag cake doesn't have the right number of stars and stripes. This year it did. Nick and the little girls followed Mike's lines and we fit it all in, just so. I piped the rest of the frosting, Sarah on my hip, and we had ourselves a fine cake. And a fine party. It's amazing how much happier (and easier) things are when Dad's around.